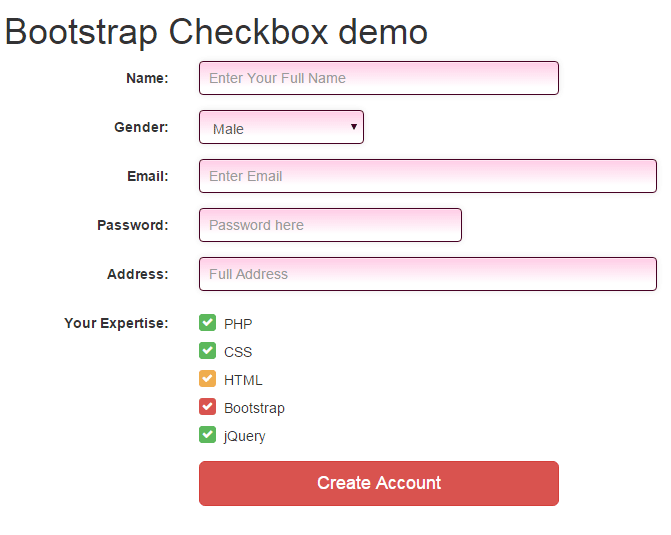 The Bootstrap framework has built-in classes to use checkboxes in the forms of your web pages. 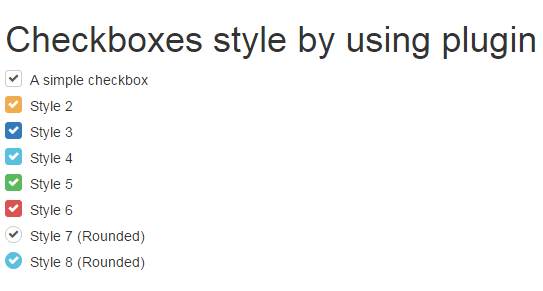 By using those classes, the checkbox will take the default style as well. You may include Bootstrap checkbox in a form independently, just like ordinary HTML forms and also include this in textboxes to add functionality like enable/disable a textbox. In this tutorial, I will show you examples of using single and multiple checkboxes along with other possibilities in Bootstrap related to the checkbox. In this example, a checkbox is created in a simple form of Bootstrap. The form is basically a sign-in form where a user is given an option to “Remember me” by clicking the checkbox. In this example, multiple checkboxes are created to allow users making multiple selections. Multiple checkboxes are created by using the checkbox class in each div that contains checkboxes. The last checkbox is disabled. In the active checkboxes, as you bring the mouse over the text or label, the hand icon will be shown. While in the “Bootstrap” checkbox, which is disabled, the ‘ban-circle’ icon is shown that represents it cannot be selected. In this example of Bootstrap checkbox, I will use inline checkboxes rather each at the new line (that I used in above example). You can see in the output, the checkboxes are inline. This is done by using the class provided by Bootstrap: checkbox-inline. The checkbox-inline class is used in the label tag for each checkbox. Just like in the above example, first four checkboxes (PHP, CSS, Java and HTML) are enabled where the hand icon is shown as you bring the mouse over it. Whereas the last (Bootstrap checkbox) is disabled with a ban-circle icon. 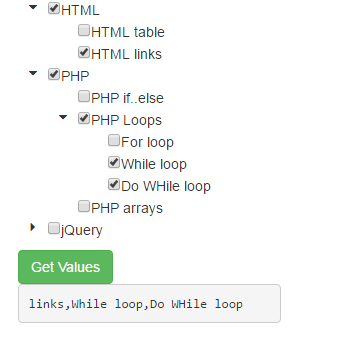 You may also apply customized styles in checkboxes as using the Bootstrap framework. For that, custom CSS can be designed or available third party plug-ins can be used. 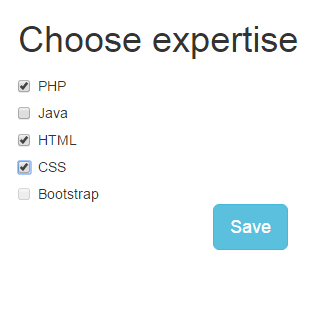 I will show you a few styles of designing checkboxes by a simple third party plug-in awesome-bootstrap-checkbox. It simply requires referring two CSS files in the head section where one is hosted at CDN and second can be hosted at your own server. Let me show you a few styles followed by step by step instructions to set up this. You can see a list of different styles that look nice by using the plug-in. You may get the style in the github website, here. This is a small file that you can host in your own server. The complete code using different styles can be seen in the demo page or visit the plug-in site by the link given below. 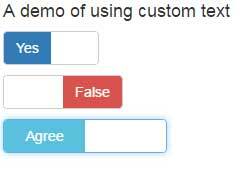 In this example, I will use a few above created checkbox styles in a Bootstrap form. So checkbox code mixes up with some other controls of the form to show how it looks. You can see in the figure and demo page, the form uses different controls including text boxes, select dropdown and a few different styles of checkboxes. The checkboxes are using the awesome-bootstrap-checkbox add-on and you can see how it mixes up with other form elements. While the head section also includes a custom CSS style which is applied to form controls. You may attach a checkbox to a textbox by using built-in classes. This can be useful for different scenarios. You can see the figure or output of the above example that two textboxes are shown. A checkbox is attached to the left of checkbox while in the other textbox the checkbox is attached to the right side. For that, the input-group-addon class is used in a span element that contains the checkbox. If you add the textbox code before that span, the checkbox will be attached at the right side. While If the code is placed after the span element that contained checkbox code, the checkbox will be added to the left. Following CSS classes are created, that you may change as per the need of the project. These classes are added in addition to the built-in classes in the input tag that creates a textbox and span tag. 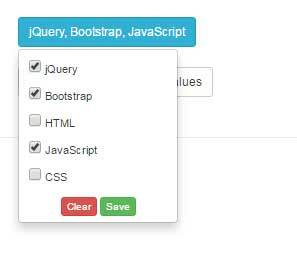 You may create beautiful switches based on the checkboxes that use Bootstrap classes along with jQuery. The good looking switches can enhance the user experience and make your forms more interactive. 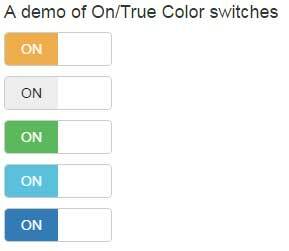 Have a look at a few demos of creating Bootstrap checkbox based switches. After that, you may also see the link for a detailed guide to setup on your website. Similarly, you may create different sized switches, setting different colors for On/Off states and use other options. I have written a detailed guide about this awesome checkbox based switches. The next demo is another nice plug-in that is based on jQuery and uses Bootstrap framework. It enables creating treeview with as many options/choice or values as you require. Against, each value or option, a checkbox is given. For details and how to set up this on your website, follow this link: treeview with checkboxes. To learn more about this, visit this tutorial: dropdown with checkboxes.